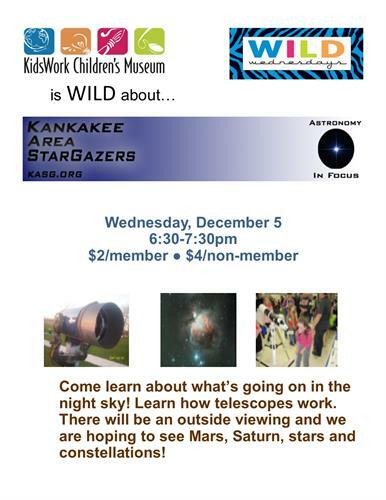 Wild Wednesday with Kankakee Area Stargazers! Name: Wild Wednesday with Kankakee Area Stargazers! KWCM welcomes Kankakee Area Stargazers! Come learn about what's going on in the night sky! There will be an outside viewing with huge telescopes and we are hoping to see Mars, Saturn, stars and constellations and more! Also, learn how telescopes work!